So, with Shelli and Clay on the block this week on Big Brother 17 and a lot of talk about everyone wanting to keep the nominations the same after the PoV challenge, this PoV challenge was pretty “Do or Die.” If you missed who was playing in today’s PoV comp on Big Brother 2015, find out right here! Keep reading to find out who won the Big Brother PoV comp and let me know what you think will happen tomorrow on Big Brother season 17! We announced the PoV players for Week 6 earlier today and now the results are in. The winner of the Power of Veto for Week 6 is James!!! Well, this is an interesting turn of events in the Big Brother 17 and it looks like one of the showmance members will be going home! With the HoH winning PoV and the fact that he really wants one of them out, who do you think will end up voted out? Oh, this is good … did I just hear that Queen Shelli was demoted to “Castle Guard” ..haaaaahhhaaaaaa…hhhhaaaaaa haaahaaa! (LOL while rolling in chair and legs in air – my Chilltown laugh!) Let’s name it CTLOL. I like it. Lets do it. CTLOL picturing Shelli’s face after POV comp. *sob* whatever shall i do? (using my best Southern Charm voice). It’s enough to give Shelli the vapors. That HOH crown was lookin’ mighty fine on James. He wears it well. And now he has a stunning V necklace to complete the ensemble. Who knew James had style?? James you handsome devil, you’re looking mighty fine wearing that stunning V necklace . Good job! Finally things are getting exciting! Now maybe all the complainers will shut up. If i had a vote i’d get Shelli out. YAY, Yahoo Yessssssss!!!! Way to James! You did it!! Yeah!!! 🙂 he did it!!! Woohoo! I’m so happy that the normal ones didn’t call all the shots this time!! I love it! I think my insides are doing happy dances, either that or it was the ice cream I just ate! either way im so excited! Game on James! your doing an awesome job!!! H O O R A Y, Jumping up and down, shaking my old pom-poms. This is the best moment in the last three years of Big Brother! Bubye Shelli!! Now lets hope for the next week or two this side of the house keeps winning HOH and has the balls to put up Vanessa and Clay next!! poor clay will be an orphan on Thursday. Thanks for the chuckles, all. After the day I’ve had (and the season we’ve had), we deserve a little kicked-back, feet-up, relaxed fun!! Yes we do!! I hope you have a better evening Lilly! Thanks, Joyce! I’m much better now that these old bones are on the couch instead of moving furniture in 95 degrees!! Would you like cake? It goes well with the feeds. Ooooo, yes please. Chocolate of course. alright alright alright!!! I couldn’t have asked for anything better…..WAY TO GO James!! Hope Shelli goes home but if not, the next best thing is for Clay to walk OUT the door. Can’t wait til Thursday!! Hahaha! ED, you are a funny guy! finally getting good and I cant wait to watch it on tv. way to go James. you are doing a great job. so sick of the shelli clay stuff. cant wait to see one of them go. I really dont care which one just happy to know that one of them will be gone on thur. I am watching BBAD .. I was anticipating some juicy stuff tonight, but it is really, really stupid. Jackie is some kind of knight and Vanessa is her squire with Vanessa overplaying her part, of course … do you know what is worse than Vanessa talking? Answer: Vanessa talking with some kind of Nordic or Irish Knight accent while adlibbing some ridiculous “tale of old” … SHUT UP VENESSA!! She has a new hat, tho. She must stay by her knight’s side and shine her armor for 24 hours. Being with Jackie for 24 hours will at least keep Vanessa from planning and plotting with Clay and Shelli … oh,yeah, and then there’s Shelli … she’s in some sort of jester looking costume, supposedly she is a castle guard, and she has to walk in a triangle hitting a bag, then a target and then a bar … that counts for 1 feat … she has to do that feat 2400 times in 24 hours … she’s acting like she loves it, just because she knows I would enjoy it if she looks like she hates it … we’ll see how she looks after a couple of hours. Anyway, at least it will keep her out of bed with Claydoh. Speaking of bed …. night, night. What would happen to Shelli if she didn’t get 2400 sets in 24 hrs? I think the punishment is that she would not get to play in the next veto, which is really a biggie unless, of course, she goes home this week anyway … she is counting on staying …. that’s why she is working so hard at finishing. CLAY NEEDS TO GO HE IS BORING! SHELLI CAN STAY! I WANT TO WATCH HER HAVE A NERVIOUS BREAKDOWN ON NATIONAL TV!IT WOULD BE CLASSIC TO WATCH HER UNFOLD!!!! I disagree!!! Shelli must go! Clay was so angry and saying he was going to tell James that he’d better win every effing comp that they have from now on or else he was going to come after him and Shelli said no, you will not. That is dangerous for all of us! Shelli is the real brains of that duo and without her, we could see some exciting stupid moves from Clay. That would be worth watching. Ed, you’re sooooo bad LOL!!!! Hmmm, not a bad idea at all ha-ha! He can’t possibly make himself a bigger target, so why not? There is a positive about being a big target tho and that is that people actually like to keep a good target around so as not to BE the target themselves. Clay has a plan to talk James into having the renom be Steve. Yeah, right! I don’t think James is that dumb. Clay has been pleading with Vanessa to vote him out and keep Shelli. Which is ok by her (she didn’t say that to him though). James wants Shelli gone. People are promising both sides to vote their way. It’s up in the air as to how the vote will go. I’d prefer Shelli go but Clay being evicted wouldn’t hurt my itty bitty heart one bit. I really do think the house would vote Shelli out over Vanessa, but too risky for my taste and I think it could hurt James’ game …. altho maybe not more than it’s already hurt. I agree. I think Shelli would be evicted if given the choice between her and Vanessa. Why piss off Vanessa when he doesn’t have to. Keep the noms the same and let the house decide. And if the house vote for Shelli is majority, it looks more like an agreement and James can beg the same old reason everyone else does “house majority”. To quote V: Do you think I would have put them up if I didn’t have the house majority? I agree. It would be easier to work with Clay. But given the situation, the one staying will be out for blood. So eliminate the one that is better at comps. Shelli is more of a threat. 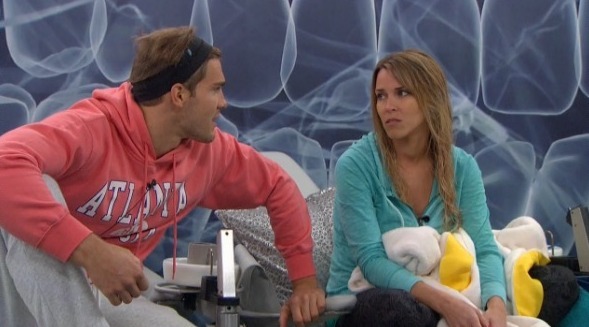 Even if James takes Clay off and renoms Vanessa…..get rid of that lying, 2-faced, smug Shelli. I’ve no love lost for Clay – and it will be a blow to the dying 6sense – but I will consider this week a sad waste of a power move if Thursday ends with Vanessa and Shelli still in the house. Period. It would be a bad move to put vanessa up next to Shelli,the house may vote to keep shelli and then you have them both still in the house together. . Keep them the same and debs shelli packing thurs! ! Renom??? What renom?!?!. Clay is a plank! Why would James waste his hard fought for perfectly good veto on either of them?! ?…..Silly boy! Silly boy with a headband! I am sooooooo looking forward to tonight’s episode. Yes. It will still be great to watch the looks on Clay and Shelli’s faces!!! When will the Veto meeting be held? I don’t know how much longer I can stand to hear Clay coming up with new ideas and Shelli telling him how that won’t work. What is up with Clay and his nervous tick of tilting his head back and forth quite often like his neck is stiff. He has been doing it every day since the beginning, so I don’t think he can chalk it up to a comp. It drives me nuts. I guess I’m an intolerant person if that irritates me. I had a boyfriend who bit his nails once and I couldn’t stand to see him doing it. I’d try not to look in his direction, but I could see him out of my peripheral vision and it still drove me nuts. Why does Jackie still have on her armor? Was that for longer than 24 hrs? I’m getting scared now. Clay and Shelli sound like they’re winning James over. He can’t see that they’re devils!!! We need someone to walk in there and blow their story out of the water.